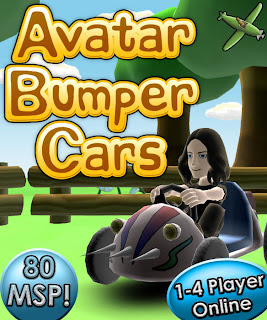 Avatar Bumper Cars Gets Online Play! Flying Squirrel Games would like to officially anounce that it's #1 selling title, Avatar Bumper Cars, has just had a patch approved for release on Xbox Live Indie Games. This patch, in addition to fixing a few minor issues found previously, incorporates the much-anticipated Xbox LIVE Multiplayer mode. We look forward to playing a game with you soon! Good day, loyal Flying Squirrel followers. Just a quick update today to mention that the Xbox LIVE multiplayer patch has been in peer review for a while now, and it's taking a bit longer to release the game this time - probably as online modes take a lot longer to review. Expect the update to hit the game within a few weeks though. As well as this, we're happy to announce that sales of the game passed 12,300 as of May 6th. This is extremely awesome and we're thankful to everyone that's bought the game so far! Hope to see you online when the patch is released!